A first call saxophonist with a long pedigree who was an early staple of Aristocrat Records output, both as a sideman and a featured artist. Archia (pronounced variously Archie… by his family, or Archer… by Wynonie Harris, but apparently never Ar-chi-AH until recently when nobody is left around who actually knew him) was from Texas where he came of age playing with such future luminaries as fellow sax legends in the making Illinois Jacquet and Arnett Cobb along with trumpeter Calvin Boze and pianist/vocalist Charles Brown. Joining Milt Larkins’ band out of college the star-studded group backed rising blues hotshot T-Bone Walker in Chicago only to soon see half of their musicians stolen from bigger name outfits. Archia was one of the few who remained and would make Chicago his home base for the rest of his career. 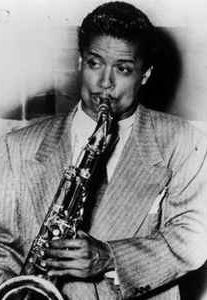 After a time playing alongside Charlie Parker, whose bop explorations would soon make him legend, Archia ran afoul of the union and was forced to depart for California and saw his career momentum stall before returning to Chicago where he found work, first in Leonard Chess’s Macomba Lounge, then was brought to newly Aristocrat Records where he was a frequent sessionist, as well as getting ample opportunity to issue records – albeit with guest vocalists – under his own name. In addition Archia free-lanced quite a bit, including cutting many sides for King Records in Cincinnati, including some of the biggest hits of 1948. But ironically after the Aristocrat label was taken over by old friend Leonard Chess the following year Archia’s work with the company dwindled as his own records failed to make much headway commercially and he was drifting back towards jazz. Finding less satisfaction with rock session work Archia resumed his club-activities where he remained a highly regarded musician by all who encountered him for years. As co-writer… with artist Andrew Tibbs. As sideman… for Big Maybelle (as Mabel Smith). As sideman… for Wynonie Harris. As sideman… for Andrew Tibbs.